B. A. Paris knows how to write a thriller! This is the second of Paris’s books I’ve read, following The Breakdown a few weeks ago. 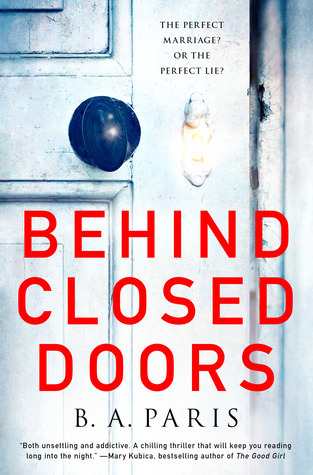 While they share some basic characteristics (British thriller, mentally tortured woman, too-good-to-be-true husband), Behind Closed Doors starts faster and hits a lot harder. Almost from the start, you know something is wrong in Jack and Grace’s marriage — something they’re both trying to hide from their friends. As the book opens, they’re hosting a dinner party. Grace never leaves Jack’s sight — while still pulling out an absolutely magnificent meal (and she’s so thin!). They’re recently married after a short courtship, and we get little hints of … weirdness. Grace quit her job immediately after they married. She doesn’t really socialize…or leave the house. She doesn’t own a mobile phone. And their house so secluded — with metal shutters on the windows and one hell of an alarm system. Once you learn what’s behind the scenes of Grace’s marriage — good lord this book is messed up. The narrative alternates between how they got there, and how she tries to get out. It’s really well-plotted and super stressful and I *could not* put it down! Share the post "B. A. Paris knows how to write a thriller!"